For centuries, Europeans believed that all swans were white  until black swans were discovered in Australia. A possibly minor moment in ornithology, but one that for Nassim Nicholas Taleb, a former trader turned philosopher, perfectly illustrates how poorly our past experience of the world can prepare us for sudden, unexpected, epochal events. His 2007 book, The Black Swan: The Impact of the Highly Improbable, gave rise to a new name for these moments, both positive black swans (the rise of the Internet) and negative ones (the 9/11 attacks). 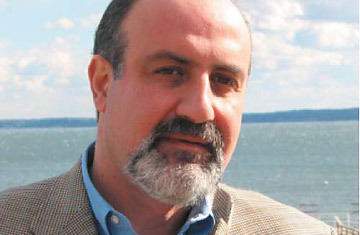 Taleb has argued that much of the recent market turmoil has been due to the inability of financial risk models to account for such black swans; meanwhile, the fund he advises, Universa Investments LP, has gained upwards of 50% this year on the back of strategies intended to manage them. Taleb talked to TIME about the market crisis we should've seen coming, how it happened and what to do next. You've said that this current market crisis isn't necessarily a black swan event. People did see this coming. It is a white swan, but very few people saw it coming, I guarantee. Nobody saw the real cost. And let me tell you the problem. The system used to analyze risk is completely defective, and actually could not keep up with the complexity of the financial products that are involved. You have what I call a geometric or exponential increase in risks. For example, if the market drops 10% you lose $100 million. But if the market drops 15%, you don't lose another $50 million, you lose an extra $2 billion. And if the market moves an extra 5% you lose an extra $10 or $15 billion. All the metrics have the effect of underestimating the impact of the possibility of very large deviations. In other words it tells you how uncomfortable the plane ride is going to be, but tells you nothing about the crash. But how do you get beyond that besides widening your margins of risk? Eliminating leverage. If you don't have leverage, you don't have that problem. We have a faulty risk management system that underestimated probabilities while giving people the illusion of understanding them. It gave people the illusion of comfort. If I give you a number, you're going to take more risk. Regardless of the confidence you have in the number. It's psychological. If I ask you to write down the last 4 digits of your social security number, and then take you out to lunch and ask you how many dentists there are in Manhattan, there's going to be a high correlation between those two numbers. What happens is that the number psychologically makes you feel confident. It's kind of like a seatbelt on a plane. It doesn't do anything. There's the famous quote Donald Rumsfeld was ridiculed for: There are things we know, things we know we don't know, and things we don't know we don't know. You're saying, basically, he's got a point. What I've done is made a very nice map of what it is that we understand and what it is that we don't understand. I've also made a decision-making protocol based on these two. There is a domain in which we can measure the unknown, provided the large deviation doesn't play a big role. What we have at this crisis is a conjunction of what I've feared the most  namely, a very large deviation, very large exposure and very high measurement error. We're talking about someone who goes into the jungle without a map. He's going to get lost. I cannot answer some questions. A lot of people are telling us what to do now. I just want to make sure it's not the same people who were flying the plane and crashing who are going to fly the plane again. We should ban banks from risk-taking because society is going to pay the price. This is not the first time. In '83 we paid the price. In '91-'92 we paid the price. They keep their bonuses every time, and every time we bail them out. Now, the fact that things came back or didn't come back is irrelevant. The fact is that we took risks and they got paid. They were gambling with other people's money. That's the point, with society's money. Banks are gambling with society's money, funds are gambling with investors' money  it's one layer better. So we should have more risks taken by funds and less risk taken by banks, because banks have a severe agency problem. ... When I trade I don't have an agency problem; I have my neck on the line. When a bank or banker trades, it's not his neck on the line. He has an agency problem, and like [former Merrill Lynch CEO] Stanley O'Neal, if you follow the strategy you're going to make $160 million, and keep it, even if you blow up. And you'll do it again. Do you think the constant news coverage of the financial crisis is making things worse? This, I don't know. I don't read the papers, I stopped reading the papers. I read the papers only during periods of crisis, and I think papers are too long on a regular day and too short days when we have a crisis. Would you call this a crisis? Are you reading the papers now? Yes, I've been following a little bit the news, to see what's been going on, and I think that now we've had a revelation that there are problems, and of a lot of things the general public needs to know. The general public needs to know that a lot of bogus claims have been made by the financial economics establishment, based on metrics that we know don't work, and a lot of portfolios are based on these underestimations of wild uncertainty. The coverage is adequate now  it's not adequate on a regular day when people just tell you the market went up one point and they give you a reason. But today we have problems. The public needs to know. But amid all this, your company is doing quite well. The only important thing about it is that I protected my clients. I offer a protection package and it does work, but I don't want to be associated with trading too much. I believe finance is largely a scam, and I don't want to be associated with that profession. You've done very well at it for a number of years. I know, I know  today I probably have the best track record in existence, because today, comparatively, all these other people have disappeared. So do you feel vindicated by this current crisis? I feel angry. Very, very angry. I described the way it happened, I described the mistakes, and I see all these people explaining it backwards. Let me make another metaphor: you have a hundred people playing Russian roulette, and one of them killed themselves, and economists are theorizing that he killed himself because he held the gun in a certain way. You require something vastly more structural. Let's go back to roots. Let's do real things. Let's have more transparency, fewer complicated products we don't understand. Let's generate economic growth by old traditional ways, let's favor technology companies, let's not favor all this financial bulls---. Because it was a Ponzi scheme, I don't know any other way to call it. So the big question on everybody's mind is, what happens now? I try not to comment on current events directly. I think that we've got to progressively become a society where banks are deemed to be too precious for us, for our currency, to take too much risk. We need to have a banker who is just as responsible as someone working for the water company. Banks are going to become a utility. And banks probably will not have a lot on their balance sheet, and the risks taken will be borne by individuals like myself who have capital, and who know the risks, with their own money. Otherwise you're going to keep having a cycle that's deeper every time.